Rolando Herrera is an American success story, from his days of washing dishes as a teenager to running his own acclaimed Napa Valley winery, Mi Sueño. When the holidays hit, it’s all about family—and his wife Lorena’s amazing homemade tamales. December means tamale time in Napa Valley, at least at winemaker Rolando Herrera’s house. And everyone in this family of eight gets involved in the preparations. are then ready for the steamer. They will be the centerpiece of the Herreras’ holiday dinner, featuring an array of dishes whose recipes have been passed down through Lorena’s family. 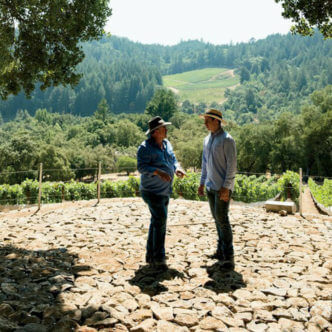 The gathering is not only a celebration of the season but also of the Herreras’ life together in Napa, where for the past two decades they have been the owners of Mi Sueño Winery, with Rolando serving as winemaker, vineyard manager and overall person-in-charge. Mi Sueño translates as my dream. Those words can have a funny ring when it comes to Napa Valley, especially when used in a press release announcing some tech-sector or hedge-fund hotshot’s decision to follow his dream and buy a winery and/or vineyard. Such aspirations are decidedly easier when you’ve got a spare $40 million or so. But Rolando Herrera’s dream was different. He first came to the US from Mexico in 1975, when his father got a job at a vine nursery in St. Helena, and lived in Napa Valley until the age of 13. Then, when his father decided to retire, the family moved back to El Llano in the state of Michoacán, population 980 or so. But after two years in Mexico, Herrera decided that whatever his future was, it sure as heck wasn’t in El Llano. So at age 15 he packed up his bags and returned to Napa Valley. After a few years of restaurant experience, Herrera shifted to vineyard work. His stroke of luck came one day when the foreman of the crew he was on said he needed a few volunteers to help out at Stag’s Leap Wine Cellars. Within a few years Herrera was promoted to cellar master at Stag’s Leap; from there he moved to stints as winemaker for Chateau Potelle, Vine Cliff and finally Paul Hobbs Winery, before taking the leap to concentrate full time on Mi Sueño. Today Herrera farms 40 acres of Napa Valley estate vineyards for his excellent Cabernets, Pinot Noirs, Syrahs and Chardonnays, and oversees other vineyards for clients through his Herrera Vineyard Management company. He has 60 full-time employees (with retirement plans and full benefits, a rarity for vineyard workers) and is one of the most successful members of a growing group of winemakers and winery owners who are changing perceptions of the roles Mexican immigrants play in the wine business and in Napa Valley. Herrera is all those things, maybe the last most of all. But no matter how hard he works he always reserves time for the one thing he’s even more passionate about than wine, which is family. So as this sunny December day slowly shifts toward evening, the kids—Perla and Valeria, plus Rebecca, Esmeralda, Victoria and Rolando, Jr., occupy themselves playing bocce, the de facto official sport of the Napa wine world. Meanwhile, Lorena gets the rest of dinner ready: crisp chiles rellenos filled with rice and Cotija cheese (“My mother came up with these,” she says); a salad of colorful, crunchy radish and avocado; fluffy Spanish rice; and creamy cranberry beans topped with chopped fresh cilantro. Soon, at a table outdoors, Lorena and Rolando are enjoying glasses of Mi Sueño’s velvety 2013 Napa Valley Cabernet, as empty corn husks pile up on a platter and homemade salsa gets passed around. Everyone talks—about family and the future, wine and food, sports, holiday plans and school (Rolando, Jr., who’s 18, plans to get a degree in enology, while Rebecca, the oldest, is already in college). Plates are passed, there’s laughter and, as the last bites of cinnamon-dusted tres leches cake are enjoyed, an air of contentedness swirls around the Herreras. They may have taken a tougher road to achieving their dreams, but it’s also been an extraordinarily rewarding one. Herrera launched Mi Sueño with the 1997 vintage of this wine. He still uses fruit from the same appellation for it, producing a Chardonnay that’s supple and full of ripe tree-fruit flavors. Lorena isn’t the only cook in the family. When Rolando grills lamb chops during the warmer months, he likes to pour guests this ink-dark, spicy Syrah. Herrera’s focus is on Napa Valley, but for this fragrant, black cherry–rich red, he uses grapes from the Russian River Valley, Sonoma County’s most famous Pinot Noir region. The flagship wine of the estate, this structured, blackberry-inflected Cabernet comes from a blend of Coombsville and Oak Knoll vineyard sites. Herrera names his top wines—including this complex, ageworthy Cabernet Sauvignon—after his children (Rebecca, 19, is his oldest daughter). Quantities of these wines are small, and they can only be purchased directly from the winery.